Before Art Modell moved the team to Baltimore, and before the frustrating expansion years and countless front office mistakes of the twenty-first century, there were the Browns of the late 1980s. The years 1985 to 1989 saw the Cleveland Browns explode out of a decade and a half of inconsistency and mediocrity to win four American Football Conference Central Division titles and make the playoffs five straight years. Twice they came within inches of a Super Bowl appearance, led by an unforgettable cast of characters Cleveland embraced and still cherishes. These teams are perhaps the most memorable in the history of Cleveland professional sports. Sundays in the Pound traces quarterback Bernie Kosar’s winding path from Youngstown to Florida to Cleveland, explains why there was so much more to running back Earnest Byner than one unforgotten fumble, and reveals how cornerback Hanford Dixon created a canine phenomenon in the endzone stands that has persevered to this day. 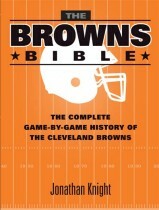 Author Jonathan Knight delves into “the Drive” and “the Fumble”; examines the fairy-tale performance of an aging veteran quarterback who directed the Browns through the snow and into the playoffs in his final game at the old, cavernous Cleveland Stadium on Lake Erie’s shoreline; and recounts an epic playoffs saga in which the Browns staged one of the greatest comebacks in the history of Cleveland sports. 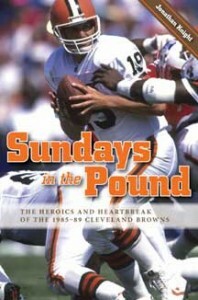 Cleveland Browns fans throughout the country fondly remember the “Dawg Days,” and they will welcome Sundays in the Pound. A lifelong follower of Cleveland athletics, Jonathan Knight has written three books on Cleveland sports history, numerous articles, and a biweekly Cleveland Browns newsletter for eight years. He has a degree from Ohio University’s E. W. Scripps School of Journalism and worked as a sportswriter in Columbus, Ohio, for seven years. Knight is currently a staff writer/editor at Franklin University.